A new report from the Pacific Institute examines Multiple-Use Water Services (MUS), a water-provision and management approach that has emerged as a way to realize the poverty alleviation potential of water projects. By connecting livelihoods to water supply, MUS seeks to improve nutrition, boost income, and help the rural and peri-urban poor climb the water ladder to make more sophisticated use of water beyond their basic health needs. As international institutions promote MUS as a new framework for funding and project design in the water sector, it is important to better understand both the opportunities and challenges of the MUS framework. 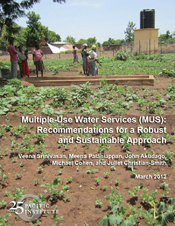 The Pacific Institute report, Multiple-Use Water Services (MUS): Recommendations for a Robust and Sustainable Approach, provides analysis of the potential benefits of MUS, primary among which is that it reflects the way communities actually use water. Sustainable water systems will continue to be one of the biggest challenges of the 21st century. Despite significant efforts and significant international funding, a surprisingly large fraction of water systems have either fallen into disrepair or have been abandoned as water sources are drained, and nearly a billion people still lack access to potable water and two billion lack access to adequate sanitation. The MUS approach stresses the multiple purposes for which the poor need water, from drinking and sanitation to growing food and productive activities – a different approach than the public sectors of most countries where bureaucracies have mandates for “single use” service delivery, such as irrigation or drinking water. MUS is rooted in the multiple ways in which people have always interacted with their local water sources, and seeks to overcome the fragmented way in which water is currently managed.